By Terry Dunn on Feb. 5, 2019 at 6 a.m. 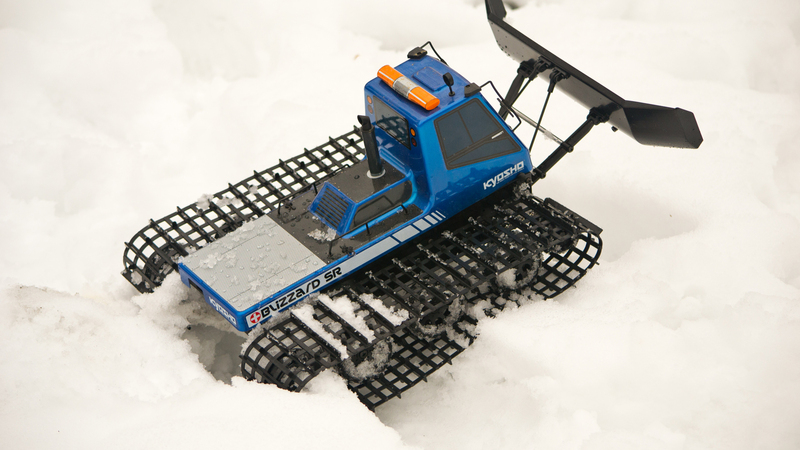 This RC snowcat is an amazing little machine that thrives in the snow. Its Wi-Fi phone controls, not so much. Here's how Terry upgraded his vehicle for traditional RC driving. It's been nearly four years since I reviewed the Kyosho Blizzard SR, an electric-powered RC snowcat. I wrote that review in summertime while visiting family in Florida. Although designed for snow, the Blizzard adapted well to the loose, sandy, foot-scalding soil. Now that I live in Buffalo, NY, I've been able to operate the Blizzard in its natural habitat. It is an amazing little machine that thrives in the snow. The stock controls, however, needed a few updates to make this machine more user-friendly in freezing temperatures. One of the selling points of the Blizzard SR is that it uses a Wi-Fi link with your smartphone for control. Kyosho's iReceiver app provides on-screen thumb controls to operate the tracks. It also shows a real-time video feed from a forward-facing camera in the Blizzard's cab. The end result is First Person View (FPV) RC snow plowing. I noted in the review that the phone-based controls worked well enough most of the time. 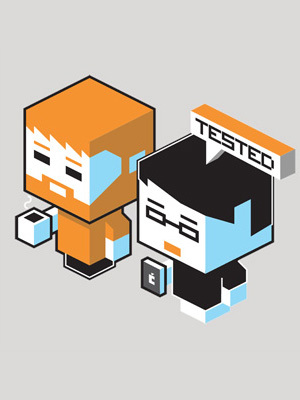 However, the connection was not completely reliable. Also, the driving controls were somewhat clunky without the tactile feedback of a standard RC controller. More recently, I discovered that the phone interface has other limitations when driving in cold weather. The first problem is that my fingers get cold and it's not much fun to drive the Blizzard at that point. Sure, there are winter gloves that work with touchscreens. Something like that could help extend my playtime in the snow. However, I've found that my phone battery degrades drastically after just a few minutes in freezing weather. So my driving time is severely limited even if my fingers remain toasty. The phone-based Wi-Fi control system of the Blizzard SR was challenging to use in cold weather. I swapped it out with a conventional RC transmitter. I decided to sacrifice the FPV feature and replace the Blizzard's Wi-Fi gear with a hobby-grade 2.4GHz radio system. I was confident that this would work out well, since I had already done a temporary swap while writing the original Blizzard review. This time, the swap is permanent. 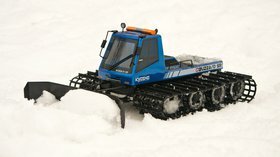 It is worth noting that the Blizzard SR is no longer available from Kyosho. The current Blizzard model, the Blizzard FR ($310), shares the same chassis as the SR, but is controlled with a conventional 2.4GHz radio system. So, I essentially converted my Blizzard SR to an FR. I wanted to set up the Blizzard's new radio so that it would have controls like those that I imagine on a tank. 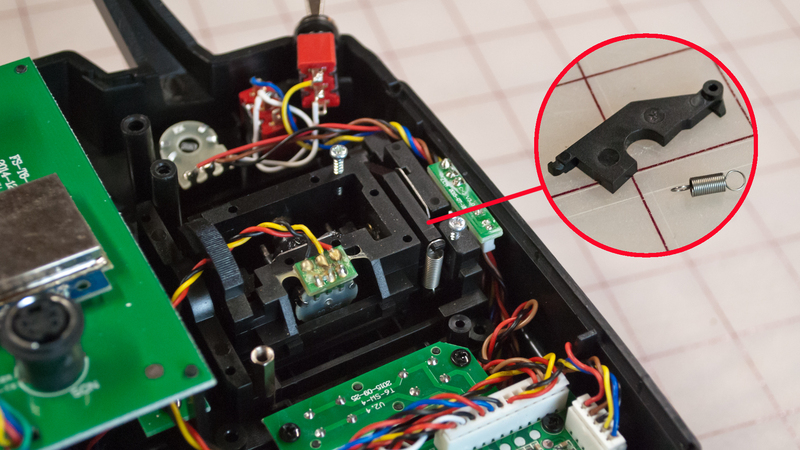 With a 2-stick transmitter, the left stick moves up and down to make the left track rotate forward and back. The right stick controls the right track. To move straight forward, you push both sticks upward. Moving the left stick up and the right stick down will produce and (very quick) clockwise spin. You get the idea. I decided to use a FlySky FS-T6 radio system that I got some time ago in a package deal. This transmitter and receiver had been collecting dust because I don't typically use FlySky gear in my models. Also, I didn't mind making modifications to the transmitter since it is inexpensive. The first step of the conversion process was to remove the Wi-Fi receiver and FPV camera from the Blizzard. My first step in the conversion process was to remove the stock Wi-Fi receiver and FPV camera from the Blizzard's chassis. 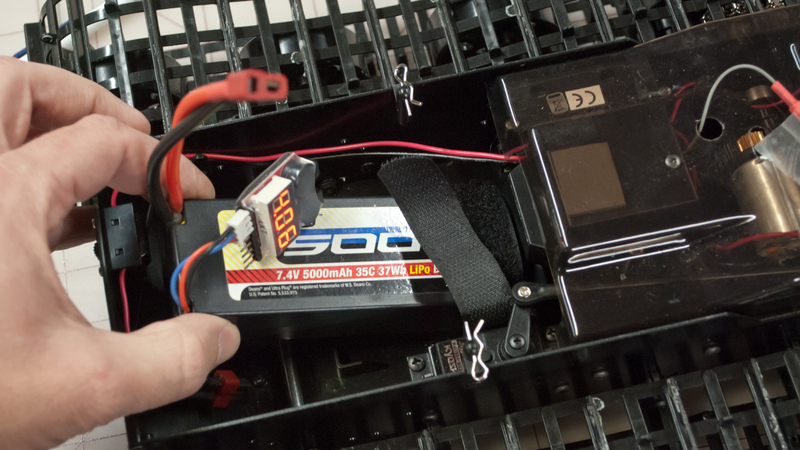 The plow's lift servo and the Electronic Speed Controls (ESC) that drive each motor were kept in place since they are compatible with standard radio gear. I had this job completed in just a few minutes. The FlySky FS-R6B receiver dropped right into place. I plugged the ESC for the left track into channel 3. I routed the other ESC lead to channel 2. Then, I plugged the plow servo into channel 6. This allows me to control the plow height using the left knob at the top of the transmitter. I then secured the receiver antenna to the outside of the radio bay cover with a short piece of tape. My only challenge with this project was configuring the FS-T6 transmitter. 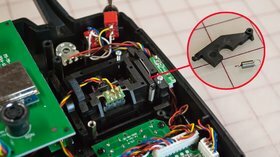 Like most transmitters set up for RC aircraft, the right gimbal is spring-loaded to self-center on both axes. The left gimbal, however, self-centers only on the left-right axis. The up-down axis simply stays where you leave it. That's the behavior you typically want for the throttle control that this axis commands. A FlySky FS-R6B receiver fit nicely in the radio bay and connected to the Blizzard's components without any issues. My desires for the Blizzard were a bit different. I wanted the left gimbal's up-down axis to self-center just like the up-down axis of the right gimbal. 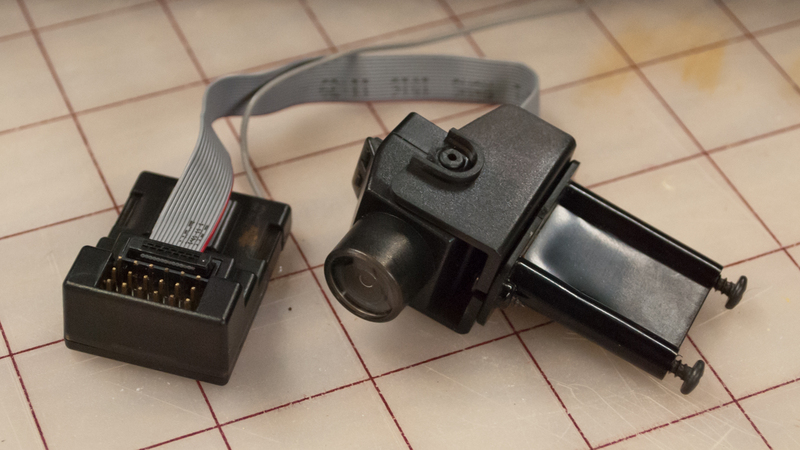 I'm sure that I could have purchased the parts required to add self-centering to the left gimbal. But it wasn't really necessary since the centering mechanism is modular. I simply borrowed the parts from the left-right axis and installed them on the up-down axis. I do not think it is necessary to explain how the self-centering mechanism works. It is pretty straightforward. You also have examples on the other gimbal to refer to. Everything dropped right into place. Small needle-nose pliers are useful here. 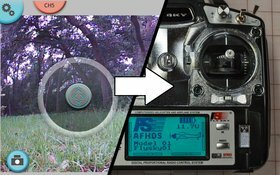 I modified the left gimbal of my FlySky FS-T6 transmitter to have self-centering on the up-down axis. I knew that I would not use the left-right axis of either gimbal when driving the Blizzard. So I locked those axes in the center location with a liberal glob of GOOP adhesive. I can always pull off the GOOP if I decide to revert back. I considered upgrading the Blizzard to brushless power, but ultimately decided against it. The stock brushed motors provide adequate speed and gobs of climbing power. In fact, the entire power system works really well and has been very durable. I didn't want to risk upsetting the balance of things. A 2-cell 5000mAh LiPo battery provides really long run times for the Blizzard. 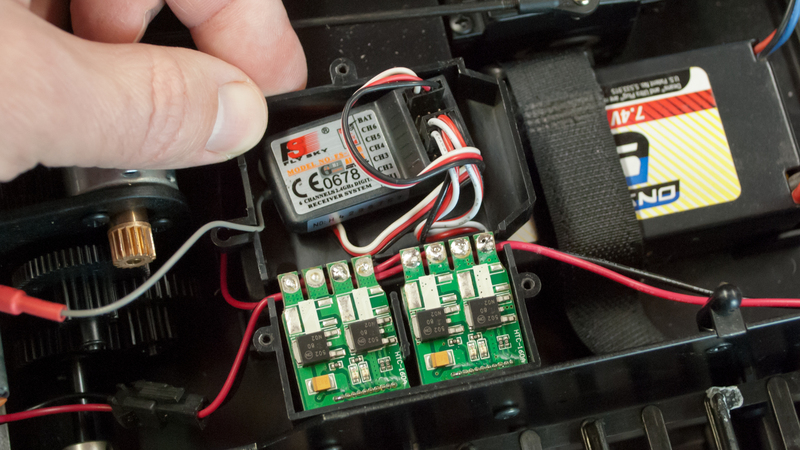 Note the discrete voltage alarm connected to the battery. The Blizzard is designed to use 6-cell packs of NiCad and NiMh batteries. I still use those from time to time. The battery I use most often is a 2-cell pack of 5000mAh LiPo cells. The Blizzard seems to run forever on them. I've never run the battery completely dead in just one driving session. I always get cold and have to come inside before the battery is drained. 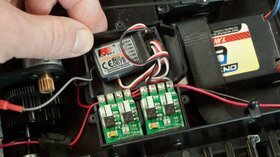 I use a separate voltage alarm on the LiPo to ensure that I do not discharge it too far. Only recently did I notice that my Blizzard was slightly damaged. One of the arms for the plow was broken completely through. That's not surprising, because it has been driven into a lot of stationary objects. I wonder how long it's been like that. Kyosho sells replacement parts. But I decided to try repairing this part first. I cleaned the area around the break with isopropyl alcohol. 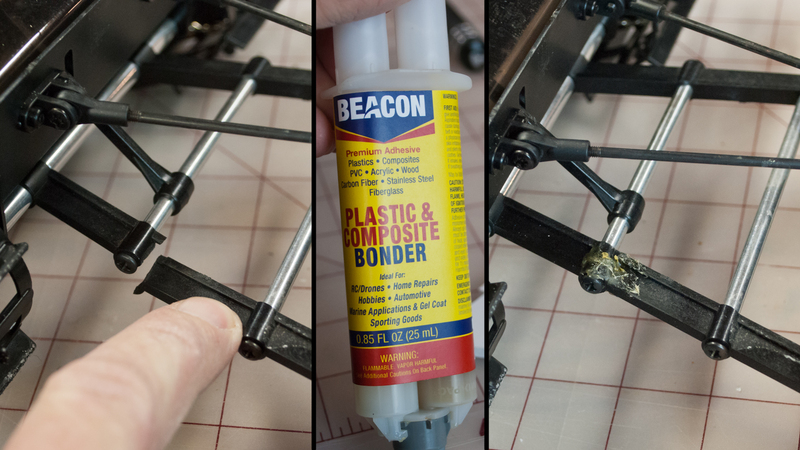 I then mixed a small batch of Beacon Plastic and Composite Bonder and spread it between and around the break. The joint has been holding together so far. I'll keep an eye on it. 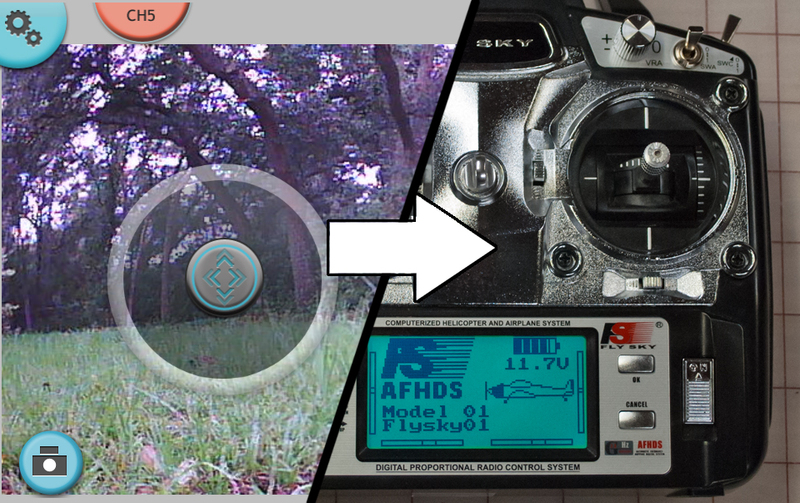 As expected, using the FlySky transmitter cured the issues I was having with the phone interface in cold weather. I can drive it while wearing my somewhat bulky gloves. Even the knob that controls the plow can be manipulated without trouble. I repaired a broken arm on the plow mechanism using Beacon Plastic and Composite Bonder. The controls are intuitive. I've passed the transmitter to several people across a wide range of ages. Everyone seems to get the hang of driving the Blizzard very quickly. The only problem is that folks are reluctant to give the transmitter back! Some people like to work the plow and move snow around. The lightweight Blizzard is only moderately successful at that. I prefer taking the Blizzard cross-country. It will crawl over just about anything! It is actually challenging to get it stuck. If the tracks are touching snow at all, the Blizzard will probably keep moving. It is unfortunate that the stock Wi-Fi controls of the Blizzard SR limit its functionality in cold weather. But I am glad that converting to standard RC gear is a simple and effective fix. I guess there is a reason that variants of the Blizzard have been in Kyosho's lineup since 1981. Not many RC vehicles thrive in the snow, but this one is a standout. It is now more capable and reliable than any of my other snow-friendly vehicles. The Blizzard is my most capable RC vehicle in the snow. It is nearly unstoppable!